The Abraj Al Bait Towers is a building complex under construction (Completion 2008) in Mecca, Saudi Arabia. 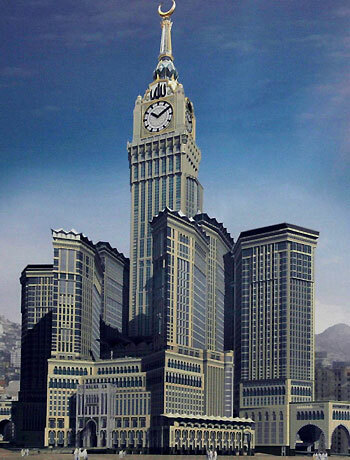 It will be the largest (not tallest) building in the world by mass, the tallest building in Saudi Arabia, and one of the tallest buildings in the world at 577 m.
The site of the structure is across the street from the entrance to the Masjid al Haram, which houses the Kaaba, the holiest site in Islam. As a result, the Abraj Al Bait Towers will have a large prayer room capable of holding nearly four thousand worshippers. It will contain a five-star hotel to help accommodate the over two million pilgrims who participate in hajj each year. In addition, the Abraj Al Bait Towers will have a four-story shopping mall and a parking garage capable of holding over eight hundred vehicles. Residential towers will house permanent residents while two heliports and a conference center are to accommodate business travellers. In total, up to 65,000 people would be housed inside the Towers. Game Show question: Why do women rub their eyes when they first wake up? Contestant's answer: Because they have no balls to scratch? 577m?! Why did they decide to increase it? Also, the renders don't look like 577m, it looks more like 400ish. That thing is massive. I understand the symbolism and, I guess, practicality, but that tower is not at all pleasing to the eye. Also, that angle is very annoying. You can only see like %20 of the complex. Hopefully updates will be from a roof top nearby. I really do not like the clock being added. I understand why it is there, it just makes it look like an oversized BigBen imo. Otherwise no complaints from me. I like it, though the clock face is out of place with the rest of the styling and needs a serious redo. The mass of the complex is the most impressive part. I think the design looks much better now! I like it. Too bad i'll never see it in person. I can imagine there would be a great view from the Kaaba but ever visiting there is even less likely. It's almost Soviet in its clunkiness, especially the ludicrously overscaled clock tower. But surprisingly the actual construction photos make it look a little better than the renderings. Between this and what Dubai is doing, I guess I'll never understand the Middle Eastern skyscraper aesthetic - or rather, the aesthetic values of the handful of oil sheiks who push these monstrous developments through with no democratic or governmental oversight and approval. It's almost as if the entire region were filled with Donald Trumps who have free reign to indulge their bad taste. that is the ugliest thing i've ever seen. It's almost Soviet in its clunkiness, especially the ludicrously overscaled clock tower. Exactly what I was thinking. Just add a hammer & sickle. In total, up to 65,000 people would be housed inside the Towers. That is an astounding #! Ugly. The 2005 version was the best. 2004 version is the worst, but this latest version isn't far ahead. Not pleasing to look at, but suppose it serves its purpose. At first glace it looked like the "New York, New York" complex in Las Vegas with Big Ben thrown in. I don't see a problem with it. Its not as if this "Soviet" style of building has a monopoly over design in Russia let alone the world. I say we let cities stray from the American glass tower aesthetic if they want to. Looks like a mix of the Venetian in Las Vegas and Big Ben. Mozart: "I never knew music like that was possible." Mozart: "No, no. One hears such sounds and what can one say but... Salieri."